"Great quality gloves at a great price. " COMMENTS: Love that I decided to pick these up. I've been using them a lot and nothing gets through them, including the stronger scents. Will be buying more when I need them. COMMENTS: These gloves are so necessary for soapers. They keep your hands clean and free of coming in contact with additives. COMMENTS: These appear to be really heavy duty gloves. Unfortunately the ones I received in the kit are medium and I wear a large and I could barely get them on. I think they will be perfect for when my kids are helping me though. COMMENTS: Nice gloves, but I prefer my nitrile ones. "Was part of a kit I purchased"
COMMENTS: Easy to use. This was in the kit I ordered. 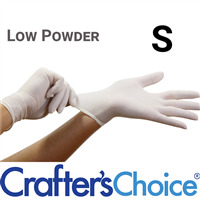 COMMENTS: Protect my hands while handling oils and powders. Great when paired with the face masks. "Great for making all your creations "
COMMENTS: Safety and Sanitary great for items you are making to sell. "Perfect for cleanliness and protection!" COMMENTS: It is so generous that WSP puts these gloves into every kit they sell. I use them every time and they are very comfortable. Thank you for promoting good manufacturing practices! COMMENTS: I normally use small gloves, but the medium works great on my smaller hands too. Easy to take on and off. COMMENTS: Works as expected and easy to use. COMMENTS: I have had more than one glove that I received in a kit break while I was mixing. Personally, I buy gloves at a farm supply store or a vet-animal supply store. They seem to hold up better. COMMENTS: I usually break out from powdered gloves but this one did just fine. COMMENTS: I rated these as average. I prefer no powder but at least it was just a light dusting of it. I had issues with them tearing easily. They are okay for mixing fizzies and salts but I like a bit sturdier glove for soap making. COMMENTS: Held up well during use. Size runs a little small. COMMENTS: Love these gloves! They fit perfect. "Safety and sanitary number one rule"
COMMENTS: Gloves are always used period. Simple washing or even a surgical scrub is still not good enough in my book. Even after a good scrub if many had a clue just what STILL was coating their hands they would never go "gloveless" again! There is a good reason a kiss on the cheek as opposed to a handshake in many countries is socially acceptable more so than a hand shake. COMMENTS: These gloves are really great to have! They don't break as soon as you put them on (like many do that I've tried from other companies). A must have in the cabinet. COMMENTS: These are easy to use and fit very nice. COMMENTS: Love the fact that these gloves keep stuff on my hands, however, I wish fragrance didnt seep through them. Anytime I use these, my hands smell like whatever scent I used due to it all soaking through. COMMENTS: Good quality and great for mixing bath fizzies without tearing up your hands. "Gloves Vinyl (Medium) - Low Powder "
COMMENTS: I received these in one of the kits I ordered and was very glad as I'd run out of my stock on hand. I won't do any type of project without them as I follow pretty strict hygiene rules when I make my stuff and these are a MUST in my book. 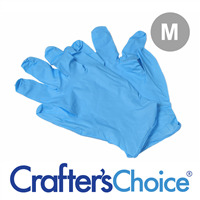 "Use gloves for everything I produce"
COMMENTS: These are very thin but came in kit so used them. I like thicker, longer gloves but these work in a pinch. COMMENTS: Part of kit. Very good gloves. "I got them in a kit"
COMMENTS: Nice quality gloves. 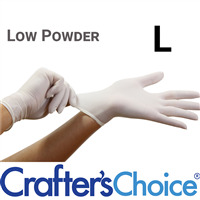 Fit well, and like the low powder option. "Received in Summer Shimmer Lotion Kit"
COMMENTS: Received a pair of these gloves in the Summer Shimmer Lotion Kit. Made Christmas gifts with my 3 year old Granddaughter using the kit. I was very confident letting her stir the color & scent into the white base lotion while she was wearing these gloves. Thanks again WSP for going above & beyond to make your customers very happy! Merry Christmas!!! NOTE: my Granddaughter's hands are about the size of a normal sized 5 year old, as she is a taller 3 year old. These gloves were a little big for her BUT they did NOT fall off or get in her way of stirring the ingredients together at all. "Good choice for gloves "
COMMENTS: I was happy with the vinyl (not latex) glove. Also it was low powder which was appreciated. This is a good choice for a generic product for everyone. COMMENTS: Great addition to the kits. Durable and easy to use. A must have for anyone that is thinking about selling their products to keep everything nice and sanitary! COMMENTS: I have big hands, and these gloves were too small. I didn't get a chance to use them. COMMENTS: Fit well served its purpose. COMMENTS: Always always use gloves! Once again I am so happy WSP provides gloves with all there kits. COMMENTS: These gloves are easy to put on and remove. COMMENTS: good glove, just to big for my hands. I require a small, but it is a must have item for everything. COMMENTS: These gloves are very strong. You can not go wrong. COMMENTS: Fits a medium size hand well. Not given to ripping. COMMENTS: A must have for making soap to sell.